Rare are manufacturers who have dared to invest colossal sums on the development of an entirely new model intended for a single market. Rarer yet is the instance of a Japanese motorcycle specifically conceived as a grand tourer. 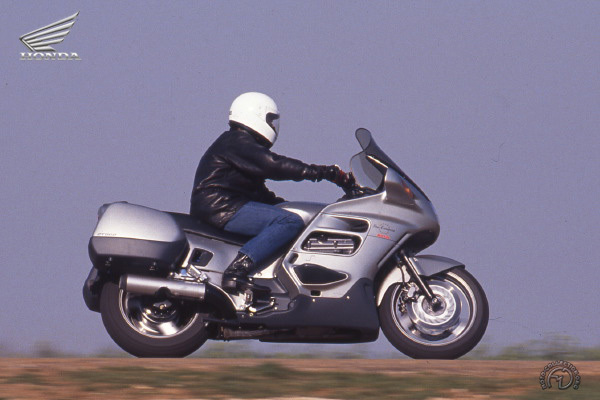 However, the Honda Pan European proved an historic exception to the rule. Honda gave its all in developing an entirely new engine to satisfy the exclusive requirements of the European market (sales of GT bikes are negligible in the US and Japan). Its most original feature – a V4 engine set longitudinally in the frame – had rarely been seen in the history of motor-cycling but made for a very narrow machine. The longitudinal crankshaft made it easy to adopt shaft drive. To eliminate the torque reaction of a longitudinally-mounted engine, the gearbox rotated in the opposite direction. The valve gear was driven by a cogged belt – as on the Gold Wing series – and the engine was housed in a tubular double-cradle frame. For better weight distribution, the tank was mounted below the saddle. Finally, the ST 1100 was endowed in 1991 with anti-lock braking on the rear wheel. Despite its weight, the ST 1100 handles extraordinarily well. Though its flexibility isn't outstanding, the engine is remarkably long-legged, which makes it ideal for long journeys where there is no necessity to play tunes on the gearbox. The fairing offers effective protection; twin panniers are optional. The ST 1100 is comfortable, but you're always aware of its weight of nearly 700 lb. Sober and superbly finished, the Honda Pan European has established a reputation as one of the finest grand touring bikes of its generation.